By most accounts, Alejandro Valverde is a humble and consummate professional. By historical record, he served a two-year ban after being linked to the Operación Puerto doping scandal in 2010. By Sunday, he became the second-oldest rider to ever win the world champion’s rainbow jersey. Love him or hate him, Valverde just won the biggest one-day race of the year. Perhaps no world champion in recent years will come with as much baggage as Valverde. There’s no denying it’s been a long and bumpy road to the top spot of the winner’s podium Sunday for the 38-year-old Spaniard. Valverde already held a record for the most world championship medals with six, yet none of them were the right color. When it looked like his career might end after a searing crash in the opening time trial at the 2017 Tour de France, Valverde said that his six world’s medals — two silvers and four bronzes — almost tasted like gold. ‘Almost’ was the key word. After botching it a few times and pulling the rabbit out of the hat to hit the podium on other occasions, the stars aligned for Valverde on Sunday in what was realistically his final shot at winning gold. When three-time defending champion Peter Sagan awarded him the gold medal on the podium Sunday — who will surely be back in the mix for a would-be record fourth rainbow jersey in Yorkshire in 2019 — Valverde was overcome with emotion. Spain’s “green bullet” was tense on the winner’s podium, almost as if he were in a dream and didn’t want to wake. In previous close calls, something always seemed to go wrong for Valverde. That was on his mind as he led out a four-up sprint after pulling clear over the final climb. After nearly two decades in the pro ranks, Valverde brings some baggage to the worlds’ podium. His links to the Puerto scandal and apparent unrepentant ways will surely anger many who say cycling is still a dirty game. His racing acumen beguiles others and on Sunday, that duality of a sketchy past and racing brilliance came bursting across the line in an emotional outburst that was 15 years in the making. Valverde turned pro in 2002 with the infamous Kelme team, a squad later implicated in the Puerto scandal. It didn’t take long for Valverde to make an impact on the peloton and he won eight races, including two stages at the Vuelta a España, in his sophomore season in 2003. By 2017, Valverde celebrated his 100th career victory with a win at Ruta del Sol. His rocky relationship with the worlds kicked off in 2003, when he won silver behind teammate Igor Astarloa in Canada. He was second again on home roads behind Tom Boonen in 2005 in Madrid. That was the closest Valverde would come to gold until Sunday. Four more bronzes would follow — in 2006 in Austria and three-straight from 2012-2014. 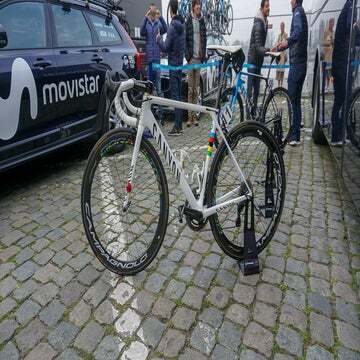 He was roundly criticized about how he raced in 2013 when a questionable tactical decision opened up the door for Rui Costa to reel in Valverde’s attacking compatriot Joaquim Rodríguez. Valverde saved the hosts’ honor in 2014 with bronze in Ponferrada, but again he was criticized for not racing more aggressively. Valverde’s consistency finally paid off Sunday. In 11 previous world championships, he’s finished them all, medaled in six and finished in the top-10 on two other occasions. He only twice finished out of the top-10 in all world championship starts. He missed last year’s worlds following his career-threatening injury in Dusseldorf but came barreling back into form this year. On Sunday, Valverde had all the pressure of pre-race favorite. Unlike on other occasions when he was young, Valverde did not let the pressure get to him. He raced confidently and controlled the final climb perfectly. Despite leading out the long sprint, no one had the legs to seriously challenge coming around Valverde at the line. Valverde erupted into an explosion of screams of joy and tears of exultation after 15 years of chasing the rainbow jersey. Valverde’s victory will seem unsatisfactory to some but deserving to others. In many ways, that sentiment reflects much of Valverde’s rollercoaster career of tremendous highs and demoralizing lows.